Soak beans overnight, drain and place in a soup pot with 6 cups fresh water, the shallots, carrots, onion and 1 teaspoon thyme. Bring to a simmer over medium heat, cover, reduce heat to low, and simmer until beans are tender (60-90 minutes). Purée with an immersion blender and season to taste with shoyu and sesame-chili oil. Serve hot, garnished with remaining thyme. Serves 4-6. Anyone who has ever plucked a tomato straight off the vine or cracked open a farm-fresh egg knows there is a world of difference between locally grown produce and food from the supermarket shelves. The farm-to-table movement, embraced by the burgeoning ranks of locavore and Slow Food enthusiasts, is flourishing for many reasons. With every delicious bite, you are supporting your local economy, reducing your environmental footprint, providing your body with wholesome nutrients, and forging a deeper connection with the rhythms of the seasons. You don’t have to be a farmer to enjoy the many benefits of local and seasonal foods. Home gardens, farmers markets, CSAs, and foraging all offer opportunities to enjoy the bounty. From local orchards and Concord grapes to artisan breads and goat’s milk products, the Farm to Table wall calendar is packed with luscious photographs and valuable tips on selecting, preserving, and preparing fresh local foods. With beloved garden writer Ann Lovejoy as your guide, it will help you savor the best of every season. 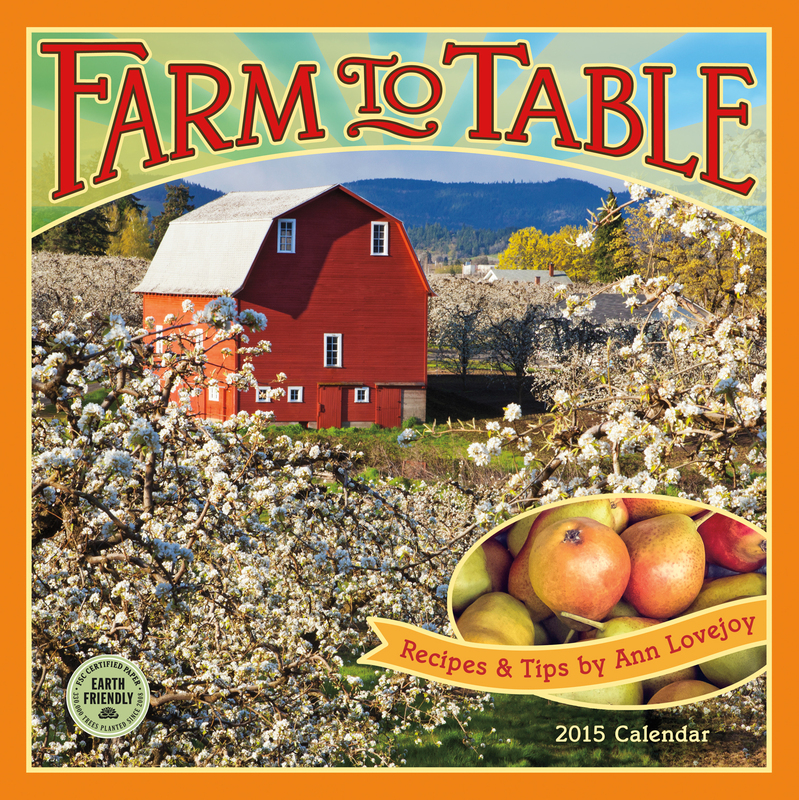 This entry was posted in Kitchen & Gardening, Recipes and tagged 2014 wall calendar, Ann Lovejoy, Craig Tuttle, CSA, farm to table, Farm to Table wall, Farmers Market, locavore, Slow Food, urban farming on February 21, 2014 by Amber Lotus Publishing.